Our feet put up with a lot of punishment during everyday activities, the cramped and often damp conditions inside trainers and shoes act as the perfect breeding ground for bacteria and fungal invaders. These unwanted guests are responsible for many of the most common foot conditions including Athlete's foot, candida and fungal nail infections. There are many over the counter medicines and creams that help to tackle these issues. However, these are often expensive and only solve the underlying issue for a short period of time. One of the most powerful and versatile natural options when looking to improve the health of your feet is daily application of extra virgin coconut oil. How Can Coconut Oil Help? Coconut oil is an extremely hydrating and moisture rich, saturated fat that possesses a wide range of antibacterial, antifungal, antiviral and antimicrobial properties. At room temperature coconut oil forms a solid white mass with a soft wax like texture, however once warmed to body temperature it quickly becomes a liquid. 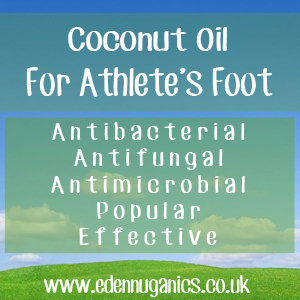 Unlike many oils, coconut oil can be stored for years at a time without going rotten making it a great product for the treatment of occasional health issues such as Athlete's foot. What Can it Help Me With? Fungal nail infection - Characterized by brittle thick nails that are prone to snapping and cracking, this condition is caused by a type of fungi known as 'dermatophyte' and left untreated can often damage nails beyond repair. Athlete's foot - Athlete's foot is caused by a fungus known as 'tinea pedis' that often results in a plethora of unpleasant symptoms including the classic itchy, flaking skin. There are many Athlete's foot cures and remedies available, yet coconut oil is known to be one of the most effective natural options. Coconut oil is one of the most popular remedies for Athlete's foot due to the ease of application. Simply warm a penny sized amount between the palms of your hands until it has turned liquid and cover the affected area. Be sure to wash hands thoroughly afterwards to remove any fungus or bacteria still in the hands. Apple Cider Vinegar - Like coconut oil, apple cider vinegar is packed full of potent antibacterial and antifungal properties that help to clear up fungal nails and Athlete's foot in a matter of days. One of the most effective methods for using ACV on the feet is by simply adding one cup of raw, organic vinegar to a bowl of warm water and soak the feet for around 10 minutes before drying thoroughly. Tea-tree - The oil of the Australian tea-tree plant is a potent antiseptic. For a soothing, healing treatment, mix equal parts tea-tree oil with olive oil and rub the combined oils into the affected area twice a day. Olive oil helps to tenderise skin toughened by Athlete's foot so that the tea-tree oil is better absorbed.